The book behind the famed 1922 movie starring Rudolph Valentino was in itself a major event, for it was the very first of the genre now known as the romance novel. An instant best-seller, its steamy and suggestive plot caused much controversy. In brief, Diana Mayo is a beautiful willful, tomboyish, aristocratic Briton with a taste for adventure who goes off on a lark for a month in the Algerian desert. She is abducted by the handsome, ferocious, barbaric, sophisticated tribal leader Ahmed ben Hassan, who ensconces her in his luxurious tents in mid-desert and ravishes her. Diana abominates her captor for two months, then falls madly in love with him. Along the way, she experiences a host of adventures, including getting captured and almost killed by Ahmed ben Hassan's hereditary enemy. Oh, and at the end we learn that Ahmed ben Hassan is really half-Spanish and half-British, and of noble birth on both sides. Well written and fun to read eight decades on for its exoticism and over-the-top romance, The Sheik both reflects and perpetuates the absurd clichés of its age about Arabs. "She was utterly in his power and at his mercy - the mercy of an Arab who was merciless." "He was an Arab, to whom the feelings of a woman were non existent." Asked if he loves anything, the sheikh replies, "Yes, I do. I love my horses." "That he was an Arab with Oriental instincts filled her with continual dread." "When an Arab sees a woman that he wants he takes her." And this, said by the sheikh to Diana: "We teach our women obedience with a whip." In addition to these many comments on male-female relations, the novel also contains a smattering of other prejudices typical of its time ("the pungent smell of the native" and the like). 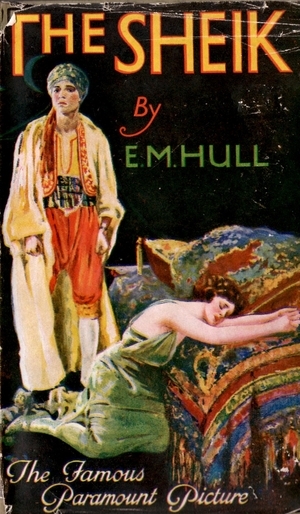 It is innovative but eccentric for a university press to reprint this monument of popular culture, especially as The Sheik's text can be found complete on the Internet (at http://gaslight.mtroyal.ab.ca/sheikXA.htm) and a copy of the first U.S. edition of 1921, hardback of course, sells for less ($13) than the reissued paperback.